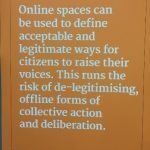 I recently attended the final Making All Voices Count (MAVC) Policy and Practice Dialogue to learn more about tech-focussed citizen engagement and accountable governance as the programme comes to an end and we look to the future. An impressive line-up of speakers across two days of plenary and breakout sessions discussed issues ranging from citizen’s online access to the use of open data sources, the risks associated with introducing somewhat ‘unregulated’ platforms and the persistent underlying constraints relating to core state functions and power relations. Thought board at the Attenborough Centre. I left pondering a seemingly significant tension. 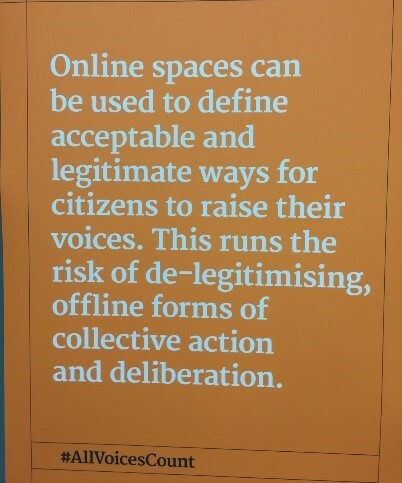 On one hand, there are the age-old underlying issues (including weak political institutions, excessive power of bureaucracy, peoples dependency on government and unequal power structures) to addressing accountability that continue to prevail , and on the other, tech-focussed solutions that can have the power to transform citizen’s individual agency by opening up access to information and services. So, what is the cost associated with introducing new platforms, where not everybody is online? Are we placing too much power in the hands of often self-appointed infomediaries who may not represent the best interests of the population? Technology is fast becoming a central component of everyday life in all corners of the world, yet not everybody is online or has access to technology. More than half the world’s population is not using the internet, with almost 75% of people in Africa non-users. Therefore the most marginalised rural populations still remain off grid so I can only assume these populations will be unheard and possibly left behind. Unpacking these key messages, what becomes clear is the importance of design and context when considering what technology, where, why and for whom. Both are equally important factors for the end user as well as practitioners who are aiming to replicate or scale-up successful tools and platforms elsewhere because not all platforms and tools are directly transferable or relevant in all contexts. 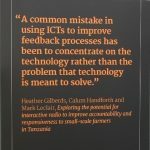 I came away feeling optimistic about the role we as evaluators can play in ensuring that the offline voices are heard through the use of technology. For example, MAVC has evidenced that the use of ‘infomediaries’ has been successful on mobile health projects in rural Tanzania. But, is it appropriate for intermediaries or infomediaries (often self-appointed) to hold the power to shape and set the rules of the accountability game at various levels of the chain? And how can we, as evaluators, ensure that there is representation and legitimacy to data? All important considerations as the use of technology becomes more prevalent in programme implementation and how we gather and analyse data to inform course correction. 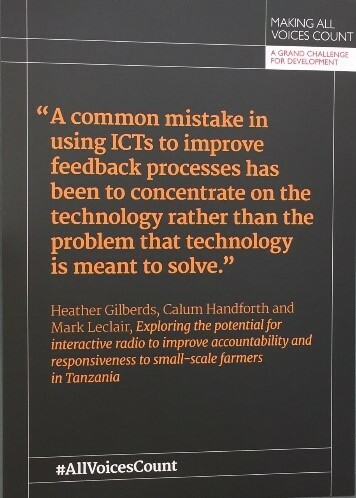 While MAVC’s findings presented limited evidence of technology opening up governance, applying the lessons that have emerged from the programme will no doubt help to inform more strategic, interconnected efforts which could have the potential to ‘connect the dots’ between the various pathways and entry points across the accountability ecosystem, creating a connected and online world where all voices count.